Recently I've been doing about 4 projects at the same time, never again! Anyway, find below the build to on of the projects. Its a hybrid but only because I got to a point and I could not make it from card or paper. 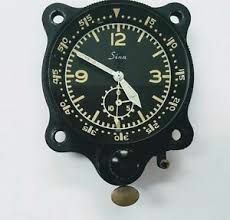 The scale is 1:1 and it will be a working clock of an aviation clock- A Sinn Nabo 17. I found on the net a perfect set of plans which I utilized to draw a working template to cut out. I used free serif software which I've used for years now and I can create anything with it in minutes. Having printed off the design I stuck it onto MDF thin card and cut it out. This I did to the main body, back and I couldn't believe it when I found a card role which was the perfect diameter for the clock working. I obtained a clock working from a company in the UK and inserted it into the main body. The cardboard tube needed the slightest of sanding out before the clock fit inside. I cut this to the correct length and so far everything was to the dimensions of the original plan. I decided that the front face of the clock needed to be strong as it is going on display so i utilised thin plastic card sheet. I drilled out the holes for the attaching screws and the clock shaft. 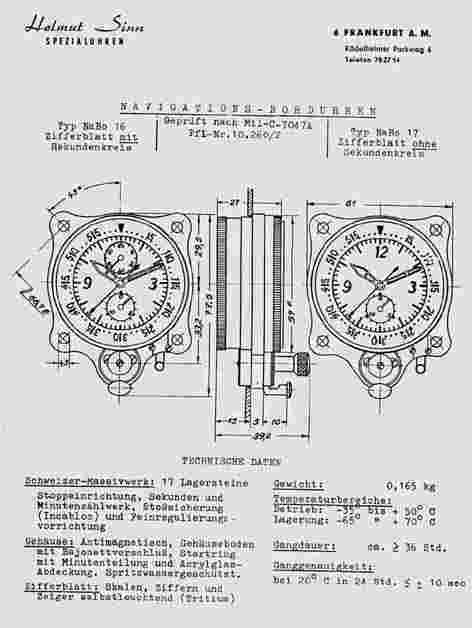 I did some more research into the clock as I required the inscription on the back of the clock and what the clock face needed to look like. Again I used Serif software and created some cool prints. I gave my ident plate a unique number. I cut them out and glued them onto card (face) and MDF for the rear plate. Clock innards are always interesting to look at. Having made a nice clock face I decided to paint the face so it could glow in the dark. This took me some time but the finished article looks cool as it gets dark. On the real item there is a pull down handle which is used to set the clock (lower right hand side). I decided to install this on the clock and if possible having it movable. With this in mind card and plastic would not be strong enough so metal was added to the model. I had to cut into the face to get the lever to fit and likewise the actual clock workings needed cutting out to accommodate this item. The bezel had me stumped for weeks I tried everything in my head to try and create a real looking bezel with an outer knurled grip. I initially used the card roll which was the correct diameter. I created the inner face where the numbers sat but I could not create that knurled look to a acceptable degree. It was at this point that a friend at work mentioned he had a similar clock which the Sinn Nabo was based on. it was a German Junghans WWII clock. I borrowed the clock and made a cast of its bezel. I bought a casting kit on the net and made a mould and cast a number of perfect bezels. likewise as I had cast left I made the winder from the same kit. I next looked at the winder and the lever I started a few weeks earlier. I made a base for the winder and used brass screws to keep it in place. I found a tiny handle which I attached to the lever, then I made a plastic cover to keep it in place. It moves up and down perfectly. Hands for the clock were made from card but as I painted them with dayglo paint they curled so I replaced them with plastic ones which I cut out and painted. I put the model next to the original and compared them, they looked very similar. 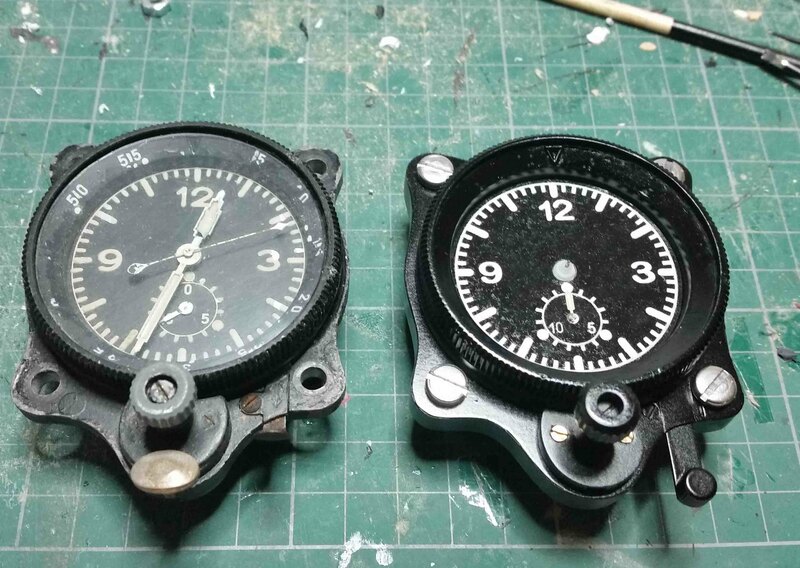 I needed a second hand making, the push button for the stop watch and glass for the bezel. The second hand is very thin but after a few hours of cutting out and sanding I had a reasonable hand. This was painted ready for attaching. The glass I made out of an old cd case. I simply drew a circle of the required size. Drilled round it and cut it out. An hour or so sanding and I had crystal clear glass. The stop watch button I made from paper card and sanded into shape. i superglued the whole button afterwards and sanded smooth. It set rock hard before painting it a brass colour. I sprayed the body matt black then varnished it and I did the same to the other items. I attached the back Ident plated and checked the clock workings fitted inside still. The clock now needed some fine detail. The bezel face needed marking off and numbers adding. I found a company in the UK which made decals for railway models. Their decals were as near as dam it to the real thing so and order was placed with Fox decals. On arrival I marked the bezel off and attached the decals and guard lines. Once dry I painted them with dayglo. I checked the glass still fit post painting and so far, all looks well. Love watching you build another masterpiece. 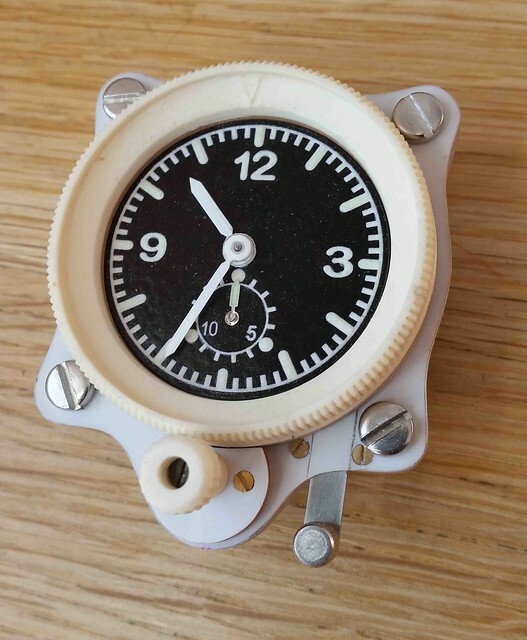 I believe what you're calling a pull handle in post #5 is what the US military refers (or referred) to as a 'hack lever', used when synchronizing watches before a flight, mission, operation, etc., anything where exact timing is critical. I still say if you ever want to start a second career that watchmaking would be a wide-open field for a man of your talents. Of course when it's a job a lot of the fun factor goes out of it for all but a happy few. Thanks for sharing another awesome build with us. Would love to see another anytime.